Lucille came to Nova Scotia from Italy, arriving via shipwreck during the hurricane. She has since spent the vast majority of her time with her mate, Gus. The two have traveled around quite a bit while trading and are now in the process of moving their family to Nova Scotia after their home flooded. Clearly a dog, Lucille is mainly Old English Sheepdog with some other unknown breeds mixed in. She is overall stubborn, dominant, loving, and loyal. Her surname is Morelli, although she does not usually use it. Nothing ongoing, but feel free to suggest something! Krokar members can assume seeing Lucille around Fiskebyn and patrolling the borders. 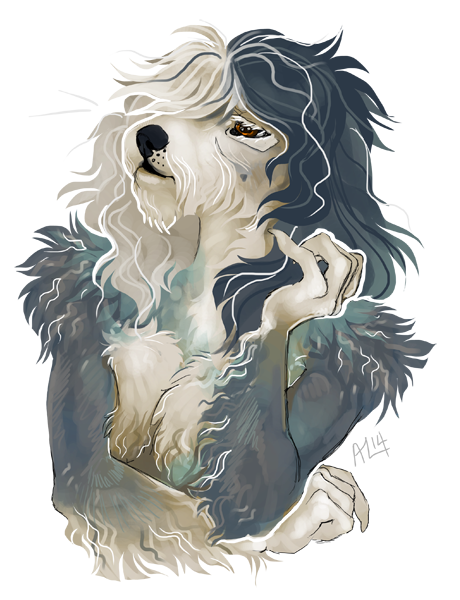 Species: Lucille mostly Old English Sheepdog, and this dominates her appearance. Fur: Her fur is long, shaggy, made up of grey and white. The white part gets dirty easily, and her fur is generally choppy from having to cut mats out. Optime Hair: Lucille's hair often covers her eyes. It is half grey and half white, parted on the right side. Facial Features: Her eyes are difficult to see, but her right is blue and her left is brown. Lucille's muzzle is round and short with a feathery beard. Build and Size: Lucille is on the large end for an Old English Sheepdog, but still smaller than wolves. Her figure is largely hidden under long, thick, wavy fur. Lupus: She has the usual round hindquarters, set higher than her shoulders. Optime: Lucille is considered pear shaped, with broad hips and a relatively small bust. Fur: Most of Lucille's fur is grey, with some offwhite, mostly on her underside. Her face, chest, stomach, right ear, lower half of her left front leg and back legs, right paw, and last third of her tail are offwhite. Eyes: the right is light blue and the left is brown. Optime Hair: the left half is grey and the right half is offwhite. This is Lucille's most common form. Her fur is still long and shaggy, and her two-toned mane grows even longer. She has a pear-shaped figure. Outwardly, Lucille is a loyal, headstrong, independent, driven canine. She is family-oriented, and thoroughly enjoys large gatherings. She also likes to be organized and have everything in its place. Lucille tries not to care about what people say or think of her, and lets most insults simply roll off her shoulders, but once she gets angry, she doesn't always know when to back down from a fight or argument. On the inside, Lucille is not quite as independent as she would have others think. She relies on her adoptive family for a feeling of security and wants to make sure that they feel safe as well. From her mate, she enjoys small reminders of his love for her, but she is low-maintenance and doesn't require large displays of affection. She genuinely cares about those around her and likes to have fun. Lucille is a bit crude sometimes, having spent a fair amount of time on a ship. While they were not pirates, she still had to make sure to stand up for herself to the males instead of letting them push her around. They taught her to use a staff, although it was not uncommon for her to hit them with a wooden spoon, either. Her talents lie mainly in trading and being an emissary. She can cook, although her food generally tastes pretty bad. It simply won't make anyone sick. She is also capable of driving a horse pulled wagon and has been learning to fish. Norah Morelli: Lucille's first of two daughters, Norah is often Lucille's shadow. Although Lucille does not play favorites amongst her children, she tended to spend the most time with Norah simply because he daughter is around her more than the others. Despite the consistent time spent together, the two have a lot of separate interests: Norah seems to enjoy spending time with livestock while Lucille enjoys patrolling the borders, however they both like organizing and Norah tends to report things she sees around the pack lands to her mother. August Cormier: the two met when Gus found Lucille washed up on the shore after her shipwreck. He thought she was dead and intended to see if she had anything valuable on her. After helping her heal, the two are practically inseparable. They are mates. Morelli: Back in Italy, Lucille has a fairly large family, although she left at a relatively young age, so she is not close with many of them. Otto Morelli: Cousin. Lucille and Otto left Italy together on a ship, and they shipwrecked upon arrival in North America. She was separated from him during this event and thinks he is dead, although he also survived the incident. Storm Cormier: is Lucille's adopted son. Gus brought him home and Lucille almost immediately took on a motherly role to him, although Gus's was more of a brotherly one. Lucille patiently and stubbornly stuck through the rough times with Storm as he slowly began to heal from psychological wounds and the two are very close. Eliza Cormier: is Lucille's sister-in-law. She often finds herself annoyed with the talkative dog, and sometimes avoids her for this reason. Becoming mothers gave them common ground and Lucille has found herself less annoyed with Eliza more recently. Finlay Cormier: is the one of Gus's siblings that Lucille gets along with the best. Although they pick on each other sometimes, it's all in jest and he is clearly her favorite of the Cormier siblings. Tybalt Cormier: is Lucille's brother-in-law that she does not get along with too well. He disliked how much she and Gus bickered and they generally do not see eye to eye. While they do not argue or fight, they do not actively seek each other out, either. Lucille respects him, however. Willow Cormier: is Eliza's daughter and sometimes too similar to her mother for Lucille's liking, but her niece's enthusiasm is something Lucille can work with and they both enjoy making maps. Semini: a long term pack member, Lucille trusts Semini and respects her greatly. She sees Semini's dedication to the pack as a boon, and even if they do not always agree on everything, Lucille appreciates her perspective. Milos Parhelion: since arriving in Krokar, Milos proved himself to Lucille. She was somewhat wary at first, only because she did not know him but he gained her trust and due to that, she gave him autonomy when it came to the pack's livestock. She thinks he does a good job as a Quartermaster, and that he is intelligent and hardworking, even if she can't quite understand how he can put up with Eliza Cormier, his mate. Iroquois: Lucille has known Iroquois for a long time and the two share a mutual respect. Lucille values her abilities to provide for the pack and seeks to make sure that Iroquois has what she needs to continue to be productive and live well. Aindrea Donovan: he and Lucille did not get off to a good start, but she appreciates what he does for the pack and values his crafting skills. Tandy McClain: Although Lucille sees Tandy as hardworking and productive, she also gets annoyed with the often positive dog and her religious ways. Elias Blueridge, Ilse Verhoeven: they both came to the pack as Flotsam, and Lucille thought just enough of them to allow them to remain. She is slowly gaining respect for them both as they prove their worth to the pack. Ciara: Lucille likes Ciara and respects her fighting spirit and willingness to learn new skills and a completely foreign culture after moving to Krokar from New Dawn. Nivosus Moineau: although their leadership styles are completely different, Lucille respects Nivosus's abilities. She is loyal to him and his to his pack, Sapient, which is an official ally of Krokar. Aspen: during the early stages of the livestock breeding program between Krokar and Vinatta, Lucille got to know Aspen a bit before handing off the project completely to Milos. Thanks to Gus, Lucille learned to trade and eventually gained a horse to pull a cart they were given by Gus's family. She is the more personable of the two, so it has generally become her job, although she still needs her mate's guidance sometimes. Before arriving in Souls, Lucille was the cook on a ship. This does not mean she is good at cooking, and in fact she is quite terrible at it. Her food usually tastes awful, but is not harmful. Lucille is capable of being a good emissary. She does her best to diffuse situations when possible, her temper sometimes gets the better of her. Thanks to the Cormier family, Lucille is capable of paddling down a placid river in a canoe without capsizing it. She is slowly improving, but after the shipwreck, it is sometimes difficult for her to be on the water if the weather starts getting bad. She doesn't particularly care for swimming, so if her canoe does capsize, she gets pretty cranky. Lucille is able to both read and write, although her writing is quite messy. Mainly she uses the skills to read maps the family has created to chart trade routes. Lucille's personal items are not for trade. They are things she has acquired along the way while traveling with Gus. The two share the cart, and the rest are items that they find to be necessary to have while trading. The necklace was a gift from Gus, which she sometimes wears and sometimes does not. These are items that Lucille has to trade. Some are her things she owns, others are from her family. She will also trade for these types of items. High value: horse tack, animal feed, jewelry, rope, weapons, leather armor, and well made clothes. Middling value: items like leather, pelts, simple clothes and unused cloth in decent or better condition, first aid items, and alcohol. Low value: food and spices (there's a reason her cooking is bad). Appearance: Tiro is a grey horse, meaning he has white fur with black skin. The black skin shows up most around his nose and eyes. His legs are also grey starting about halfway down. Personality: Overall Tiro is quite lazy and mellow. He will stop walking any chance he gets, and when nudged into a walk, it will seem like he's leaning forward until he absolutely must take a step. He is a good horse for beginners, although more advanced riders may find themselves bored. Personality: Capire is a very intelligent cat, and has become more confident. He speaks English and Italian (which he and Lucille speak together), and used to be able to speak German and some French, but a lack of practice meant those languages have faded. He is fluent in both high and low speech, and can read some books. Lucille was the only surviving puppy of a litter born to a very young first time mom. Their family was close anyway, and she was raised amongst some cousins as well. When she and her cousin were almost a year old, they decided it was time to head out and travel. They managed to get work on a ship, Lucille as the cook and her cousin as a sailor. In 2012, the ship they were sailing on got caught up in the hurricane and shipwrecked off the coast of Nova Scotia. Lucille has no idea if her cousin or any of the other crew members survived as she has never found them. Lucille nearly drowned, and washed up on a rocky shore. She was cold, wet, and cranky when a male dog came up, intending to loot the bag that she managed to hold onto. Unfortunately for him, the bag was empty and Lucille was still alive. She learned that his name was Gus Cormier, and Lucille resisted his attempts to help her, although she eventually gave in because she had no other choice. His healing skills were minimal, but he traded with a healer, goods for skills, and Lucille slowly recovered. As she healed, the pair traveled. Gus never told her to leave, so she simply stuck around. He helped her trade for a horse and she realized they actually were going in a specific direction: to his home. The pair argued along the way over many things while a bond began forming between them at the same time. When they reached his home, Lucille met his family at the same time they learned some bad news: his parents died in the hurricane. The grief they shared of losing someone important to the hurricane bound them closer together. As they healed together this time, the pair became mates. Gus and Lucille continued traveling and during one of their trips home, the rivers flooded, forcing the little group to move. Lucille and Gus searched for a new place to settle while gathering more members for their group. They eventually chose a new home and the rest of their family joined them to form Krokar. Lucille meets Aindrea Donovan and they do not exactly hit it off. Lucille and Gus meet Theon Russo and invite him to join them in forming Krokar. Lucille and Gus meet Zelda Arreopath and invite her to join them in forming Krokar. Lucille finds Delphinium D'Angelo lost and helps her find her way back to Salsola. Lucille meets Gunslinger Russo and invites her to join in forming Krokar. The potential founders of Krokar meet in Fiskebyn. Lucille meets Kawthar in Black Lake. Krokar members gather to form their pack. Along with August Cormier and Claude, Lucille grooms some horses and then gets chased by Honks the goose. Lucille and Gunslinger Russo help Gavin finish putting the roof on a house. Storm Cormier arrives in [[Packs/Krokar]. Storm Cormier and Lucille attempt to anchor a raft in Black Lake but end up capsizing their canoe. Lucille finds a fox, Ramsay Kit and shares a meal with him. Octavius Poer de Angelo teaches Lucille the basics of hand to hand combat. Lucille comes across Mariana Rojas, who is dying some cloth in Fiskebyn. Lucille meets Semini and invites her to join Krokar. Lucille meets Artemisia Eternity who goes by Ophelia Lockehart in the Miramichi Watershed. Carya Aston visits and Lucille talks with her about Krokar and Vinatta. Lucille and August Cormier visit Vinatta and meet Florina Soul and pNPC Miskunn and discuss relations between their packs. On their way back from The Outpost Lucille and Storm Cormier are given trouble by a loner. Lucille brings Octavius Poer de Angelo and Semini into the Ruins of Tog where they find a crumbling church. Octavius Poer de Angelo and Semini accompany Lucille and they find an overgrown orchard and pumpkin patch. The discovery of a school in the Ruins of Tog with Catriona Donovan and Artemis Nightclaw. While exploring Amherst, Lucille and Semini meet Tyris Kurosoul. Lucille and Theon Russo discover an abandoned mine shaft. Taro Kurosoul brings an injured Faolan Kido to the borders and is met first by Semini and then Lucille so that they can get him some help. Lucille meets Ascher Stormbringer on the border and brings him into the pack lands. Under Lucille's supervision, Taseko teaches Octavius Poer de Angelo the basics of taking care of Caribou. Lucille and Milos Parhelion explore an old emergency shelter dug into the side of a hill. Lucille and Semini talk about Storm while patching a wall in Lucille's cabin. Tyris Kurosoul moves to Krokar and Lucille meets him on the border with his mother, Palaydrian Soul. At the border of Krokar, Lucille and Gus meet with Sapient's leaders, Ardoise Moineau and Nivosus Moineau an agree to a trade deal. At TheOutpost, Lucille trades with Axelle Napier for a cat, Capire.p. Lucille pays a visit to Aindrea Donovan and his puppies. While healing from his injuries, Faolan Kido decides to Lucille he wants to join Krokar and since he cannot remember anything including his name, she suggests Dylan. Lucille and August Cormier meet Amorette Aston at Krokar's borders and receive gifts from her. Lucille receives a table made by Faolan Kido, who she knows as Dylan. Lucille and August Cormier decorate for the winter holidays. Lucille requests that Gunslinger Russo make a set of shelves for her. Ambassadors from Cour des Miracles arrive at Krokar. Lucille receives a gift from Vidar. Became a Greenhorn on DD Month YYYY. Became an Outrigger on DD Month YYYY. Became a Wayfarer on DD Month YYYY. Became a Magnate on DD Month YYYY. Became a Navigator on DD Month YYYY. Became a [Co-Rank Name] on DD Month YYYY. Achieved four co-ranks with [Co-Rank Name] on DD Month YYYY. Created the [Co-Rank Name] co-rank on DD Month YYYY. Became mates with August Cormier in 2012. Claude, Elias, Gavin, Hazel, Iroquois, Pepper, Taseko. 10 July 2014–10 October 2014. 10 July 2014–10 January 2015. 10 July 2014–10 July 2015. 10 July 2014–10 July 2016. 10 July 2014–10 July 2017. Adopted Characters on DD Month YYYY.